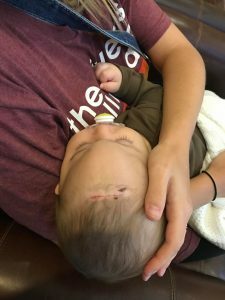 Our craniosynostosis journey was similar to many others. My husband, Clayton, and I had our sweet Syland Gene Stoup on July 27, 2017. 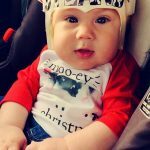 Until Syland was diagnosed with metopic craniosynostosis, I never truly understood why people would say, “I just pray the baby is healthy.” I’ve heard that statement so many times and never actually considered the chances of having a baby with any health issues. For some reason, I assumed that my baby would be like all of the other babies. I figured he would arrive and we would have all of the normal “first time parent” experiences, and we did. We had the sleep deprivation, all of the dirty diapers, the all crazy cluster feedings. We had all of the same experiences as other families but God had more in store for Syland. 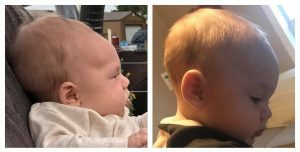 At Sylands two month appointment, his pediatrician showed some concern for his head shape. Syland was extremely cone headed at birth but I assumed that it was due to him being in the birth canal for too long. I pushed for two hours with him and made little to no progress before they finally took my back for a cesarean. The pediatrician assured us that it was only for precaution and she didn’t think we really needed to worry. She referred us to Cooks Children’s Hospital in Fort Worth, Tx. We live in Odell, Texas and Fort Worth is a good three hour drive for us. We left early that morning and got to our appointment. I remember the drive there. We weren’t worried at all. We both thought Syland was perfectly normal but there was a little voice in the back of my head that kept saying, “But what if? What if there is something else going on?” I brushed it off and told myself it was just me overthinking. Once we arrived, the nurse called us back to the room to meet with the neurologist. 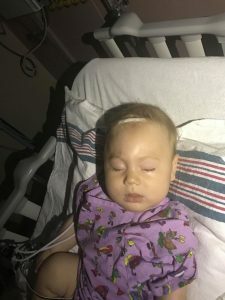 The doctor came in, looked Syland over, felt of his head, then leaned back in his chair and said, “Your son has a thing called Metopic Craniosynostosis.” Craniosynostosis is the premature fusing of bones in the skull. There are a few different kinds depending on which bones in the skull are fused. Metopic craniosynostosis is the premature fusing of the front two bones in the skull. He explained to my husband and I that Syland needed to have the surgery in order to have a normal life. He told us that with those bones being fused, his brain would not have the proper room to grow. He also explained that there would be pressure built up behind Sylands eyes and that it would later interfere with his vision if the synostosis wasn’t corrected. The doctor said, ” The surgical procedure required is known as CVR (Cranial Vault Reconstruction.) The neurologist makes a zig zag incision from one ear to the other across the head and goes in to reconstruct the fused bone. 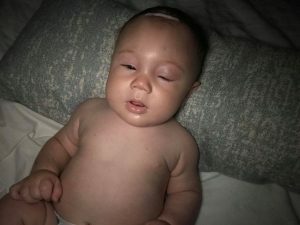 Then, a plastic surgeon comes in to make sure the forehead looks natural and normal.” The surgery would take place when Syland turned 6 months old. The doctor warned us that there is usually blood loss during the CVR surgery and that it would most likely require blood transfusions. He also said that Syland’s eyes would swell shut after the surgery and be swollen shut for 3-5 days. 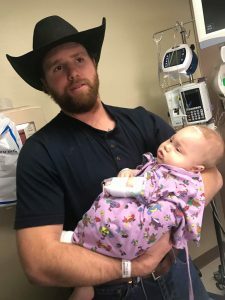 He explained that the swelling is usually the hardest part for the family to see because the babies can be extremely fussy. He then went on to tell us that the scar would be pretty big but he said that his hair would later cover it up. All of the information we received that day put Clayton and I in shock. I’ll never forget that car ride home after that appointment. 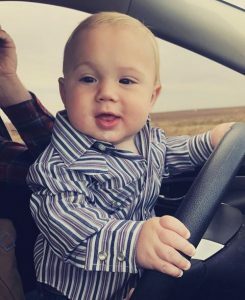 My husband did not shed a tear the entire time at the appointment but as I was sitting in the back seat with Syland, I glanced at the rear view mirror and saw my husband falling apart. He let me be the one to break down first and I’m extremely thankful for that but I’ll never be able to forget seeing the strongest man I know, wiping tears from his eyes. This was definitely the biggest trial we had ever been though. I felt like I had no business being a mother. 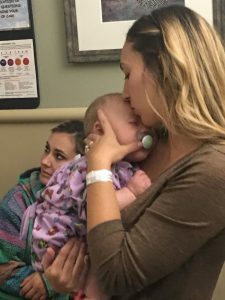 I had no idea how to help my baby. I felt guilty that I made a baby who would have to suffer and undergo surgery at such a young age. I prayed and prayed for many nights and days. 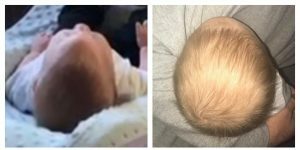 I was afraid to even search craniosynostosis on the internet because I didn’t want to see what Syland was going to have to endure, but I knew that I had to. I spent everyday researching craniosynostosis and other surgical options. I came across a doctor in San Antonio, Tx that offered an endoscopic surgical procedure. I started looking up the endoscopic surgery and read that there is a cutoff age for it. The cutoff age is 3 months old, which Syland already was. I called Dr. Jimenez in San Antonio but he was on vacation and wouldn’t be back until the beginning of December and by that time, Syland would be 4 months old. I continued to research to try to find a doctor who would preform the endoscopic surgery on Syland ASAP. As I was researching, I realized that the first hospital we visited in fact did offer the endoscopic surgery.. however, they failed to even mention it to us. I felt a bit betrayed that they would withhold extremely important information from us. My husband and I both decided that we were no longer comfortable with Syland having surgery there. I felt as if they hid it from us because the Doctor we saw didn’t do that type of surgery. I became extremely angry with him because I felt like he had deceived us. If I wouldn’t have gone home and researched for weeks, I would have gone along with the Cranial Vault Reconstruction surgery. I don’t have anything against the CVR surgery, but I knew it wasn’t right for my son. 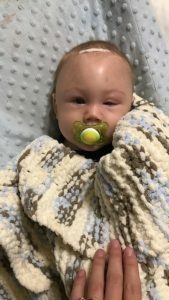 I joined a craniosynostosis support group on Facebook and asked if there were any doctors I could get Syland into fast to have the endoscopic surgery. A few mothers told me that there is a doctor in Houston who does the endoscopic surgery. They gave me the number but when I called them, they told me that they couldn’t get Syland in for another month. 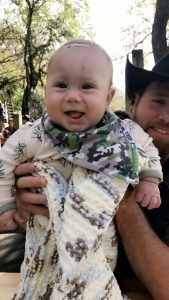 I begged and pleaded and told them that he was already 3 months old and that we didn’t have any time to waist, but they said they couldn’t do anything for us. I continued to call doctors all over the United States to see if any of them would get Syland in ASAP for the endoscopic surgery. Nobody took me seriously. I felt like no one would help my baby. I just wanted to speak with a doctor; Not the front desk, not the nurse, not the physicians assistant, the doctor. I couldn’t understand why nobody would say, “Let’s get you an appointment scheduled as soon as possible so you can bring Syland in and we can make this a done deal.” Nobody. Absolutely nobody would get Syland in fast enough to have the endoscopic surgery until we finally caught a break and got a call back from Houston. We got an appointment with the plastic surgeon in Houston when Syland was 3 months and 1 1/2 weeks old. Clayton and I were so excited and continued to pray that the doctors in Houston would do whatever they needed to do to help our son. We made it to our appointment in Houston and the doctor came in the room and discussed the endoscopic surgery with us. He explained how it is preformed and all of the things we needed to know about it. After getting our hopes up, he asked me, “How old is your son?” When I told him that Syland was 3 months and 1 1/2 weeks, he excused himself from the room to go speak with the neurologist. 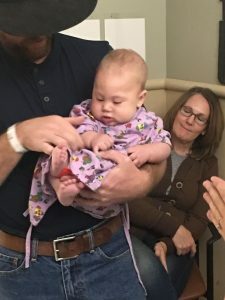 After a few minutes, he returned to the room and said that the neurologist denied Syland for the endoscopic surgery because he was over 3 months old. He said that that bone gets is too hard by 3 months of age for the endoscopic tools to cut it. He apologized and said that they could do the CVR surgery on him but he no longer qualified for the endoscopic surgery. Helplessness ran throughout my body. It felt like everyone I had spoken with during the time Syland was 2 months old to 3 months old, completely waisted our time. Our sweet, precious time that Syland did not need waisted. We left Houston with heavy hearts and an abundance of discouragement. Clayton and I decided that we were just going to give ourselves some time to take everything in. If the CVR surgery was our only option, we had a few months to just enjoy Syland before hand. 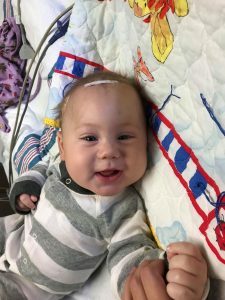 I had a mother from the craniosynostosis support group reach out to me and tell me that I should still try to give Dr. Jimenez in San Antonio a call. She said that Dr. Jimenez had a different age limit on the endoscopic surgery. I gave his office a call and they scheduled Syland for an appointment the following Monday. To my surprise, Dr. Jimenez called me personally the next day. I explained to him our situation and told him that Syland would be 4 months old the next week at our appointment. I explained to him that if he was going to get us down to San Antonio just to tell us that Syland no longer qualifies for the endoscopic surgery because of his age, that we would both be waisting each other’s time. He assured me that he had no intentions to do that to us. He asked me to send him Sylands CT Scan and some pictures of all of the angles of Sylands head. After doing so, he approved Syland for the endoscopic surgery and scheduled it for the Thursday after our pre op appointment with him on Monday! Monday finally rolled around and we arrived to our appointment in San Antonio. 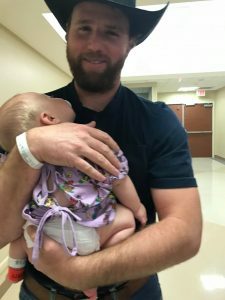 Clayton and I both weren’t sure how to feel quite yet because we had been so discouraged by all of the doctors we had previously met with. Dr. Jimenez called us back to his office and started looking Syland over. He started explaining to us why he was so confident in the endoscopic surgery and he backed up every piece of information he told us with his own personal research. I was extremely impressed with how much research he provided for us when we were there because we had asked so many of the same questions for other doctors and they would say they were unsure. Not once did Dr. Jimenez fail to answer any of our questions. After going through all of his research, he told us that he would treat Syland just like he would his own child. At that time, Clayton and I were both won over by him. We were finally considered a patient by a doctor and not just a number. The day of Sylands surgery, I remember feeling so many different emotions. We took Syland to the hospital and waited for Dr. Jimenez to call him back. When he came to talk to us right before the surgery, he prayed with us. Sylands grandpa prayed for strength for Syland and wisdom for Dr. Jimenez and his team. Watching the nurse take Syland back for surgery was definitely the hardest part for me, but when we got to the waiting room, a sudden peace came over me. I assumed I would be a wreck the entire time Syland was in the operating room. Thankfully, I wasn’t at all. I was calm and collected and had complete confidence in Dr. Jimenez. Finally, the nurse came back to let us know how the surgery went. She told us that Clayton and I could only bring 2 others back with us to hear Dr. Jimenez’s consultation over the surgery. Clayton and I both chose our mothers to go with us. We waited and when Dr. Jimenez came into the room, he asked where the rest of the family was. I told him we thought we could only bring 2 back with us but he told me to go get the rest of the family so they could all hear. I adore how much character he has. He knew that this was a lot to take on and that we needed our big group of family with us the entire way. After we all squeezed in to hear the latest updated, he explained that the surgery went very well. Syland only lost a couple tablespoons of blood and the surgery only lasted 50 minutes. He told us that they would keep him on Tylenol and Motrin and that he would check on us tomorrow and see how Syland was doing and that if all was going well, he would discharge us and send us to our hotel. He then handed me an envelope with the piece of hair that he cut on a paper as a keepsake. I began to cry because I felt so much love from Dr. Jimenez and was so thankful that God sent us to him. 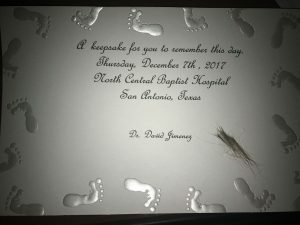 He then went on to tell us that there was another baby boy from Georgia that also had metopic craniosynostosis that he had just preformed the endoscopic surgery on right before Syland’s. He told us that crazily enough, both of our baby boys were born the same day, weighed the same amount, and both had surgery the same day at the exact same place. He took us to meet the family and it was so good to see their sweet baby handling his recovery so well. Meeting another mother and father that were going through exactly what we were was so good for us. Nobody who hasn’t had to go through this will ever understand how hard it was. Being able to compare our stories and ask each other questions was so relieving. We went back to ICU where they had Syland. To our surprise, he looked fine. The swelling hasn’t begun yet and the incision was so small and neatly done that it was hardly noticeable. It was such a relieving feeling to see him doing so well. At the same time, it was heartbreaking seeing him hooked up to all of the monitors. His tiny purple hospital gown and his prayer quilt from our church laid under him will always be an image stuck in my head. I remembered my mom coming in to see him and she said, “He looks so good, Trebby. He doesn’t even look like he just had skull surgery.” It made me feel so good to hear that. I did so much searching and I just prayed that his surgery would go smoothly. Of course that night Clayton and I got absolutely no sleep. We just watched Syland all night and would call the nurse in any time he would start whimpering or groaning. I hated that he was in pain. It killed me to see my baby hurting but I had faith that it would only be a temporary pain and that he would never have to go through this again. The next day Syland was still in a bit of pain. He slept most of the day but when he would wake up, he would mostly whimper and cry. To our surprise, he was easily consolable though. He was so exhausted that he would just fall back asleep after about 20 minutes of being awake. After lunch, Dr. Jimenez came by to check on Syland. He was doing much better at that time and Dr. Jimenez told us to go to our hotel and get some rest. He gave us the instructions on the Tylenol and Motrin we would be giving Syland and told us to continue it until he was feeling better. He also told us to go out and enjoy San Antonio! He said Syland was fine to go out and see things. Dr. Jimenez gave us his personal cellphone number and said to call if we needed absolutely anything! The first night without the doctor and nurses was scary for us. We set an alarm to know exactly what times to give Syland his medicine and we held him all night long. He would wake up and cry when he was hurting but if it wasn’t time to give him medicine, it was really stressful. Clayton and I would just take turns rocking him until it was time for more medicine. 48 hours post op was when we really started seeing the swelling. His eyes were close to swelling shut but thankfully never fully did. However, with all the swelling going on, Syland was finally completely back to normal. He wasn’t crying or fussy at all. We continued to give him his medicine just in case but we were extremely happy that he was acting like our baby again. I’m so glad Dr. Jimenez told us to get out of the hotel. It helped to take Syland out so we could take his mind off of everything. We went to the zoo, the river walk, and Gruene and Syland loved it! He had so much fun. If he wouldn’t have been swollen, nobody would have ever even thought he had just had surgery. Monday arrived and it was time for us to go get checked up by Dr. Jimenez and to go get fitted for our helmet. We went to the appointment and Dr. Jimenez greeted us in the waiting room and he was thrilled at how well Syland was doing. He told us that there was another family who’s baby had metopic craniosynostosis that was visiting from Oregon. He asked us if we minded sharing our experience with them because they were still trying to decided on what surgery to do. We were more than happy to meet with them and tell them how well Syland’s surgery went. I think that by them seeing Syland doing so well with barely any swelling by this time, that their minds were put to ease. It felt so good to share with them and it was also nice to talk to another mom and dad who were dealing with all the same emotions we had. After we got the all clear to go get our helmet, we headed to see Dr. Poidevin. Dr. Poidevin is who Dr. Jimenez had teamed up with for the helmet therapy. The first day we actually met him was the Monday of Sylands pre op visit. We were headed up to his office and met him in the elevator. He saw Syland and said, “I know that head shape when I see it. You must be headed up to see me.” Yes, indeed we were. Dr. Poidevin scans the baby’s head and then sends it to Florida for the helmet to be made. The helmets get shipped over night and then we meet with him the following day for him to do any shaving or rearranging that the helmet needs to fit perfectly. It truly is a work of art what these two doctors can do with the human skull. We got our helmet and we were ready to head home. Syland didn’t have many issues with his helmet at all. The first few weeks of him getting used to it were tough but after that, he didn’t even remember it was on his head anymore. He was such a trooper dealing with all he had to go through. We had a follow up visit with Dr. Poidevin 4 weeks later to make sure his helmet was still fitting properly and that his head was shaping the way it should. He made a few adjustments and then set us on our way and scheduled us to meet with him again in another 4 weeks. 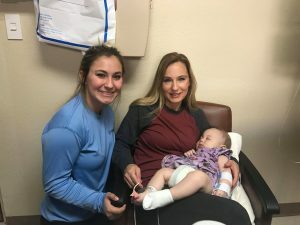 At our 2 month post op appointment with Dr. Jimenez, we were completely shocked to hear him say that Syland would only need 2 more months of helmet therapy. He said that Syland looked great and that his head already would be considered a normal shape. 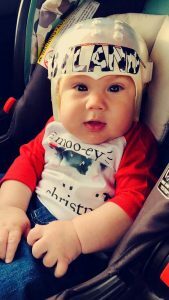 We were told that it could take 12-18 months before he graduated helmet therapy, but with the power of prayer and amazing doctors, Sylands craniosynostosis journey was nearly over. With excitement, clayton and I called our family to tell them the news and everyone was overjoyed. Syland Gene Stoup is the toughest little boy I have ever known. We went to San Antonio so afraid of what we were about to face. Actually, completely terrified. When we all prayed in Syland’s room before his surgery, I think at that moment, we all knew he was going to be just fine. Something about that moment has changed all of our lives forever. Have you ever felt God? That day I felt him more than I ever have and I can say for a fact that he has used Syland to touch many hearts. God had a purpose in all of this. He has brought us closer as a family. He has made others kiss their babies a little more. He has given so many a reason to pray. And praying is BELIEVING. People I know that hadn’t prayed in years, knelt down and begged for God to watch over Syland and keep him safe. As I lay here and stare at my beautiful son, I can’t help but to give thanks to God for blessing us with such a perfect baby boy. Craniosynostosis was definitely a huge obstacle for our family but we learned so much trough this whole process. Syland has truly become a testimony of our Lord. Doctor Jimenez has impacted our lives in a way that we will forever be thankful for. God has worked through him to heal our precious son. All along we had been asking God, “Why? Why would he do this to our baby?” Why was not the question that needed to be asked. 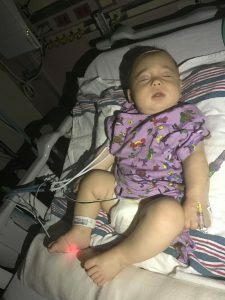 The question we should have been asking the entire time was, “How is God going to use what we are going through?” Since Sylands surgery, I have felt extremely influenced to help other families going through the same situation we had to overcome and that is why I wanted to share Sylands story. Dr. Jimenez and Dr. Poidevin, we will never be able to thank you enough for all you have done for Syland and many other children. We were so blessed to be put in your hands. We will forever be thankful for your research, wisdom, and kind hearted spirits.